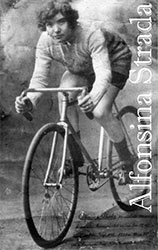 I just happened upon this great article about Alfonsina Strada, the first woman allowed to race in the Giro. Check out the quote. In the early 1900's there were a few European women who were bicyclists, but their skill was seen as more like a circus act, and people believed that they were possessed by the devil, or considered to be amoral and certainly were not normal wholesome women. Oh, how times have changed. Well, maybe. I can't say I'm normal nor wholesome and I'm sure my husband would say I've been possessed at times. Eh, whatev.